Increased use of remote work may be changing management styles and the tech tools teams use to communicate, but as we’ve covered here on GigaOM before, it’s also changing our physical workspaces. Some offices are opting to go modular, making their workspaces as flexible as their occupants’ work schedules. Others are emphasizing spaces for collaboration, ripping out some traditional individual work areas in favor of places where groups can huddle together. GlaxoSmithKline, the global pharmaceutical giant, thinks it has found the cure for the drab, inefficient office: fluid spaces where you do what the moment requires, alone or in groups, moving throughout the day. Each employee has a laptop with a built-in “soft phone,” a locker for personal possessions, and maybe one file drawer. That’s it. Even U.S. head Deirdre Connelly doesn’t have an office…. Why do it? “We found that only 35% of work activity took place in offices and cubes, yet we were dedicating 85% of our space to those,” says Edward Danyo, manager of workplace strategy. “It’s about creating environments so people can do their best work, and we’ve seen a 45% increase in the speed of decision making. But our biggest surprise is that within two weeks most folks say they wouldn’t go back to cellular space.” Bonus: The design saves money by saving space. Check out the complete article for a visual explaining exactly how these innovative offices are laid out. GlaxoSmithKline is certainly not the only company trying a fairly radical re-thinking of the office. Zappos, for example, has even gone so far as to try to re-imagine the relationship between corporate campus and surrounding city, blurring the line between work and home life in their new downtown Las Vegas space. Play office futurist – what do you foresee for the office space of the future? What do you do when you need to be left alone to accomplish something? This is a prime example of the new digital age & the virtual workplace. Itâ€™s good to see that some companies are realizing the benefits of remote working! A lot are still trying to get their head around the â€˜social thingâ€™. These companies need to make the leap quick because ultimately new employees that are digitally native are ushering in a new era of the virtual workplace whether these business are ready or not. We conducted a recent survey into this [http://telligent.com/resources/m/white_papers/1353367.aspx?Redirected=true] and it was astonishing to see that 79% of UK businesses donâ€™t provide social tools in the workplace. I’d feel like I’m in a coffee shop or library and I work best in these environments. I think this is a great idea. I’m far less efficient on a laptop than on a computer with a big monitor, traditional keyboard, and mouse. 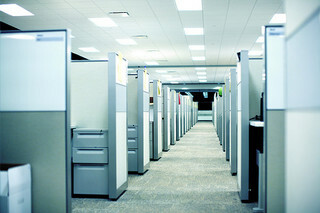 How do employees doing visual work, or extensive typing, function in this environment? Increased use of remote work may be changing management styles and the tech tools teams use to communicate, but itâ€™s also changing our physical work-spaces.